Our bottle bag is the red croc one. I am so glad I have it, easy to wash and stands all the bottles up steady, 3 in a row so they don't spill. We premake a set of bottles, then have a water bottle and more formula in the bag along with extra onesies, wipes, diapers, small toys, color crayons and paper, fruit snacks, chapstick and gum, somehow I haven't found a spot for my scriptures...odd, but it won't always be that way. Nathan, the kids and I heading to church. It seems like a lot of work. When a friend of mine had twins (no real health complications) she didn't go to church for about a year. Dear friends at church are willing to hold babies for us, quite often I don't even get one! A friend of mine Linda, has 4 boys, her youngest is 3 and her children are so good with babies. 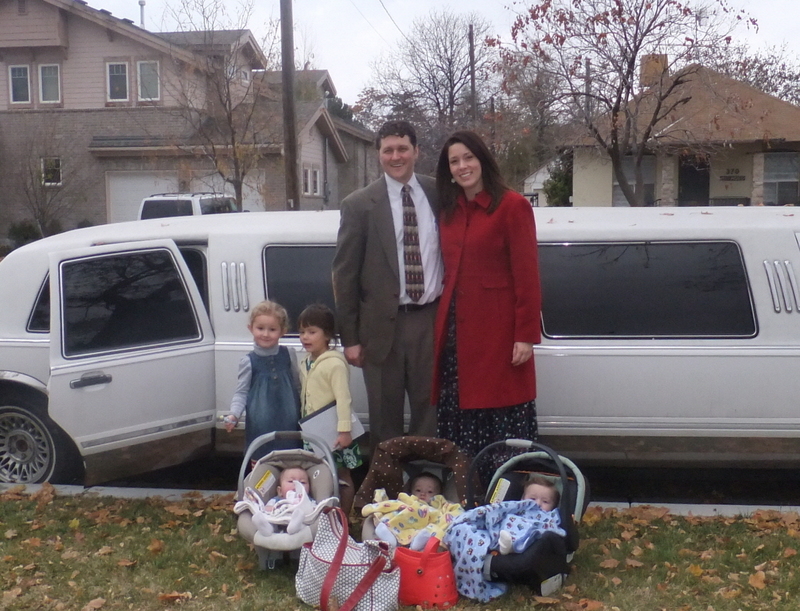 Marley, Hogan and Beckett all come sometime during church asking to hold or carry the babies to the limo for us. Melissa, a young women also takes babies for us and comes over after school every once in a while to save my bacon. So many others have a season pass to the babies or are frequent fliers, sometimes I feel I have offended someone that wanted a baby and didn't get one, I wish I had more to go around! I will someday miss the big smile and hands outstretched, "do you have a baby for me today?". When the babies are older, I hope I can be that for someone else someday. I am blessed to have so many kind hearts in one place. At church, I bring my own piece of bread for the sacrament. I can't eat wheat at all and would be sick if I tried so I hold out my bread during the sacrament prayer and from what I understand, it is also blessed. Only I have to keep a wary eye open during the prayer because small busy hands find it the perfect offering and have gobbled it up a time or two. We take the bread to remember Jesus' body and that he sacrificed it for us. I believe Jesus lived and died for us. I believe there is a plan for each us on this earth. That we can return to live with Heavenly Father again. I know the scriptures are a road map to becoming like God. They give me peace and joyful insight as I read them. I love Christmas. I love the Savior of the World. I think about his humble beginnings. How it was foretold that he would wear a crown, yet on this earth, the only crown he wore was made of thorns. I wonder if Mary knew as she held him as a baby, that he was the reason, that he would heal her, and all of us. I know he will come again, I love the scripture that says, 'every knee will bow and tongue confess that Jesus is the Christ'. When He comes again He will wear a true crown, He is King of Kings and Lord of Lords. God be thanked for the matchless gift of his son. A lady in my ward would put her bread in a ziploc and give it to the young men and they would have it on the tray and make sure it got to her. Just an idea so you don't have to worry about small, busy hands.